This is the kind of place that I could frequent daily for the rest of my life and never get tired of it. I could tell as soon as I stepped foot in the small storefront at 1406 W. Belmont in Chicago that it was my kind of place. It’s small. It serves pizza, appetizers, gelato, coffee, and espresso drinks. It’s comfortable and the owners are extremely gracious. What more could you ask for? Oh yeah, the pizza rocks! 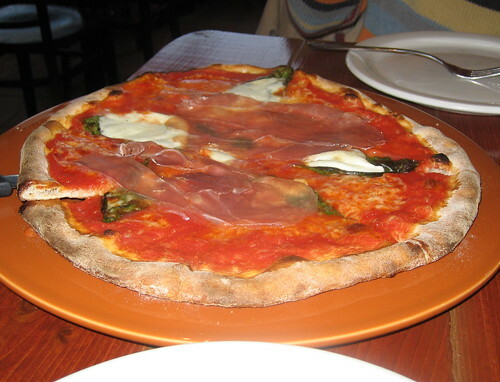 Pictured above is the Pizze Margherita, and we added the prosciutto. It was $12. I can never get thin-crust pizza done right at home, I guess maybe an oven that costs about $100,000 would help (I have no idea how much they paid for it). The key is to get the crust done uniformly throughout all 360 degrees of pizza, no matter how thick it is or how much stuff is piled on top. They got it right here. My wife and I went early on a weeknight so there were not many people there. It seems like the husband works the kitchen and the wife runs the front of the house. They appear to have some Italian roots because when the wife said mozzarella, it sounded like she just stepped off some piazza in Rome. She’s just standing there explaining the menu to us without a hint of any accent, then the word mozzarella comes up and she turns into Monica freakin’ Bellucci. It was cool. After the meal we talked with her about the restaurant, about the bench from a church that lines one of the walls, and what it was like when someone from Metromix came in to try the place. I am getting more adventurous with the pizza the next time I go, because I will be back. Posted in food on 2007/03/01 by John.